so it’s not a surprise they consider them VIPs. 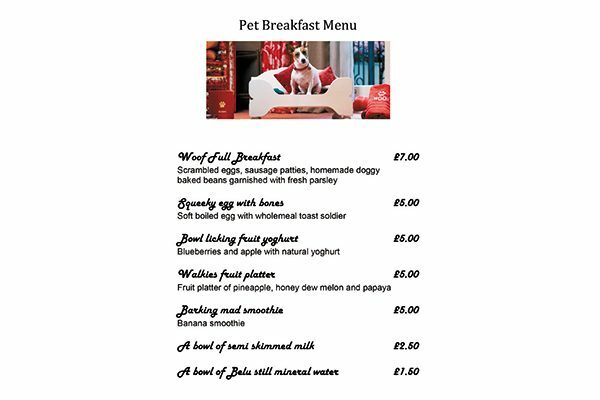 The pet breakfast menu at the Egerton House Hotel in London. The Egerton House Hotel has its own mascot, General Manager Michelle Devlin’s Jack Russell Terrier, Milly, who as Guest Liaison Dog greets new friends to the hotel, especially for the Doggy Afternoon Tea. Served in the Drawing Room and specifically designed for discerning pups, the tea includes a selection of tasty treats (like chicken and beef meatloaf), homemade dog biscuits, dog ice cream and a special take-home chew toy. And, you can join your pet with the indulgent Afternoon Tea for humans. If tea isn’t enough, the Egerton House Hotel also offers first-class hospitality for its overnight fur guests, including a turndown pet treat, dog sitting and walking service, special pet menus and more, plus a Pet Spa Day Experience — four hours of pampered grooming for your pet. More details at egertonhousehotel.com. The post Have Tea with Your Dog at the Egerton House Hotel in London appeared first on Dogster.